A team of cameras and staff trespass into a boys’ dormitory where everyone is still asleep. Suddenly, they begin to blast none other than – you would’ve never guessed – Monsta X’s “Trespass.” Soon after they are rattled out of their beds, the Monsta X members are exposed in their most natural state and herded into the living room to learn of their new variety show Right Now. It is a typical idol variety show beginning. But this time, the show is introduced as one in which the members are allowed to do whatever they wish in a “noninterference real variety show.” It sounds great – except for the fact that it is currently 6 A.M. and all the boys really want to do is go back to sleep. Of course, they really don’t have a say in the matter. I suppose that when it comes to variety shows, there’s never time to question things. You just have to go with the flow. Interestingly, though the show is heralded as a “noninterference variety show,” it doesn’t technically give Monsta X free reign. In fact, the only things that falls under the category of “noninterference” are the choices that Monsta X come up with. But even then, those choices are made with consideration of the prompts provided. The Monsta X members are first asked to individually choose certain activities or locations. For example, their first mission is to choose a beach that they wanted to go to. The crew members then provide them with a game that they had previously prepared, and the person that wins the game gets to choose what the entire group does and where they go. In these initial episodes, the games were typically games in which each member had an almost equal chance of succeeding in, which made the show more unpredictable and exciting. The premise of the show is actually a particularly interesting one. In the world of Korean variety shows, we are all too familiar with the shows that are overly and completely scripted; the most notorious of these being We Got Married. As Right Now progresses, it is obvious that it would be extremely difficult to script. After all, whatever happens is (on the most part) due to chance. For the most part, the members get to choose whatever they wish to do (of course, probably under some constraints), and the person that wins the game of chance gets their wish granted. Whereas in other shows the activities are completely dictated by the production team, in this show, the Monsta X members get to decide on their own fates, and each choice typically has a roughly equal chance of occurring. However, this format is slightly changed beginning from episode 4 when the activities are dictated by Got7’s Jackson. For a group so energetic and eager to sabotage one another, this premise seems to work well. After all, in episode 3 they decide to make the two most awkward group members have a “date” on the Ferris wheel. However, is this quality entertainment? (Quality in the sense of it being intellectually stimulating.) I would argue that it is not – but when did entertainment have to be logical or intellectually stimulating? This is the type of show that you watch while you’re folding laundry or eating a meal. Undivided attention isn’t exactly required. However, it definitely helps that Monsta X is a group that knows variety very well. For the sake of variety, they are willing to throw in weird choices to spice up their options. If they all chose desirable and fun activities, the show wouldn’t be half as interesting. Due to the inclusion of these less exciting choices, the activity chosen occasionally and inevitably ends up being the least favored choice of most of the members. To name a few, Monsta X ends up eating at a chicken restaurant (probably the Korean equivalent of eating at an American KFC) after taking a trip to the seaside; eating at a Thai restaurant in Hong Kong; and eating outside food in McDonald’s two separate times – for that one though, they have the wonderful Jackson to thank. Also, Monsta X always have adequately annoyed and bewildered expressions when they end up doing less-than-favorable things. More importantly, none of them are shy, so that definitely adds in an element of hilarity when they give their all even when doing embarrassing things. I still can’t get over the fact that they brought sizzling iron pots into McDonald’s. Way to be inconspicuous – and embarrassingly entertaining. The production team also knows their job extremely well. I commend their ability in choosing the most interesting ways to decide on Monsta X’s fate. The weirdest one was the one in which they set a live octopus on the ground and had the octopus choose the winner. The most interesting one was the one where they flipped to a random page in the tour guide and the person with the most people on the page that they opened to was the winner. Additionally, the editing is well done, and the captions also spice up the scenes. 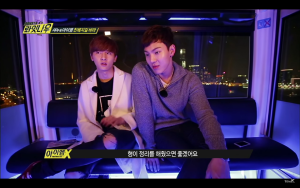 Even the “boring” Shownu’s antics are funny because of the “elderly-like” way in which they are framed. However, I would argue that this format would not work quite so well for any other group. This show is a good source of entertainment because Monsta X has a good, boisterous energy to them. If it were a calm group, the show most likely will not work as well because the group would wordlessly take punishments and it wouldn’t be half as entertaining. Also, maybe this is a known variety no-no, but it seems that a more logical group would spin the odds in their favor so they could get a paid vacation. I certainly would give the illogical members a talking-to so the majority gets to have their idea of fun. However, Monsta X let themselves fall into chances where they end up doing things that they do not want to do, making for much better entertainment. Of course, with the right editing and directing, the show could be just as entertaining with any other group. You just need the right witty captions. However, directing and editing can only go so far, and Monsta X’s antics appear to be enough to easily fill the fifty allotted minutes without making the work overly strenuous for the production team. Unfortunately, this show can only be seen as one which people might tune into when they have nothing better to do. It’s a sort of mindless, guilty-pleasure-type of show that you could miss multiple episodes of and feel no need to go back and catch up on. It also isn’t the type of show that is longstanding – which it probably isn’t meant to be. The format would probably become boring after too many episodes because the premise starts off as a joke in which Monsta X seems to be given freedom, when they are actually getting a skewed version of freedom – because what is variety without suffering right? This is what makes the show seem fresh and fun. However, in episode four, the show seems to begin veering back towards the format of a typical, scripted show. Though Jackson is the supposed mastermind, one can’t help but feel that what he chooses must be created within constraints. But seeing that we hear the staff laughing in the background while Jackson thinks of things for the Monsta X members to do, maybe they did give Jackson free reign. Overall, Monsta X’s Right Now is a fun, oddly addicting show that one could watch in their spare time. Is there anyone else tuning in that feels the same way?